For Darryl “DMC” McDaniels, it was also the moment that cemented the hip-hop trio’s place in history. "Walk This Way" allowed the group to leave a dent in music and popular culture still visible today. The unorthodox collaboration would be just one among many groundbreaking achievements for Run-DMC. 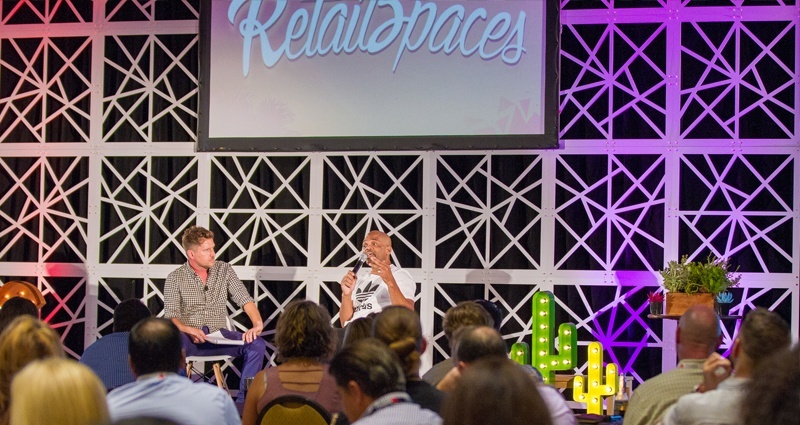 Taking the stage at RetailSpaces, McDaniels revealed the winning mindset behind this success. “That's important when you go into anything. 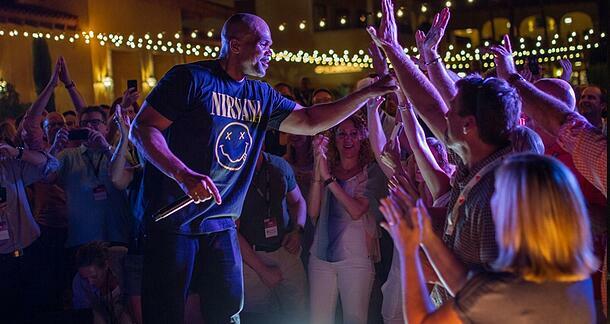 I don’t care what it is — music, business, arts, design, manufacturing...Anything!” McDaniels said. McDaniel’s wisdom is exactly what retail needs to hear. Jostling for the consumer's attention is increasingly difficult to do. In an ever evolving landscape, companies can’t expect to coast along with the status quo. Things are changing fast in the race to redefine the future of brick-and-mortar. The rise of experiential retail spaces that sell no products is a perfect example of this. For designers, the task of standing out in a sea of sameness may seem like an impossible task. But McDaniels maintained there’s always an opportunity to rise above the rest. Run-DMC’s ascension to stardom showed new concepts can both disrupt and propel an entire industry. “We proved it’s possible to do things in any industry, any business, any art form or any form of presentation or creativity,” McDaniels said. Run-DMC’s lingering influence on hip-hop and the wider music industry is easy to spot just about anywhere you look. Apart from pioneering the concept of the mashup in their aforementioned Aerosmith collaboration, Run-DMC was also the first rap group to appear on mainstream radio, MTV and the cover of Rolling Stone. They were also the first in the genre to snare a Grammy nomination, as well as multi-platinum status. In 2009, Run-DMC was inducted into the Rock and Roll Hall of Fame. Yet it’s the group’s efforts off the stage that paint their impact all the more impressive. The enduring bond formed with not only hip-hop fans, but music lovers from all walks of life was a feat rarely achieved before. Their simple, yet striking logo is ample proof of this legacy. Today, it remains emblazoned on everything from hoodies in a skatepark to onesies sized for toddlers. “We didn’t want a logo that was just going to mean hip-hop. We didn’t want a logo that was just going to represent black people. We didn’t want a logo that just meant music. We wanted a logo that resonated with everybody and meant everything we represent,” McDaniels said. What Run-DMC represented was a shift away from prevailing rap culture. Up until that point, the genre had succeeded in alienating a large part of the population. “I’m not the King of Rap. You see rap nowadays right? It’s negative, it’s disrespectful, all anyone does is fight on Twitter,” McDaniels quipped. He believes it was their passion to empower others that ignited an explosion in popularity, kicking off a cultural revolution in the process. “We had a purpose in our creativity! “The reason we were able to do what we did is our music was positive, it was inspirational and it was motivational. We knew that was a stronger force than rhyming about negativity,” McDaniels said. For McDaniels, the value of a positive message is impossible to overstate when building a brand. However, he also urged authenticity in everything one sets out to do. “Your presentation, your demonstration, and your execution have to be sincere,” he said. Whatever it was about how Run-DMC marketed themselves, undeniably, it resonated with followers. Though fans weren’t the only ones paying attention. At Adidas headquarters, executives were confused as to what was fueling a huge surge in sneaker sales. Unaware of Run-DMC’s hit “My Adidas” and the effect it was having, the company took some time to put two and two together. Investigating further, Adidas dispatched marketing head, Angelo Anastasio, to the group’s 1986 performance at Madison Square Garden. While belting out the track in question, McDaniels took off a sneaker and held it high in the air. In response, thousands in the sold out arena hoisted their own Adidas kicks, chanting along with him. “Angelo ran back to Adidas... ‘It’s true! It’s true! It’s really happening!’ About a week later, they called and said they were going to give us a million dollar sponsorship deal and free Adidas for life,” McDaniels said animatedly. Ultimately, it led to a worldwide pop culture movement, creating a new dialogue between big brands, celebrities, and customers. It’s a model that continues to dominate advertising. “I am the reason Yeezys get sold!” McDaniels declared, half-jokingly, referring to the wild success of Kanye West’s line of sneakers. He also explained what inspired them to write the Adidas song. “The first thing a drug dealer would do when they got some money was go buy new sneakers and jewelry and cars and all that. But also on that street corner was me. I went to St John’s University and I rocked Adidas too,” he said. It may be 16 years since the last Run-DMC album, but McDaniels continues to spread some good in the world, albeit in a different way. 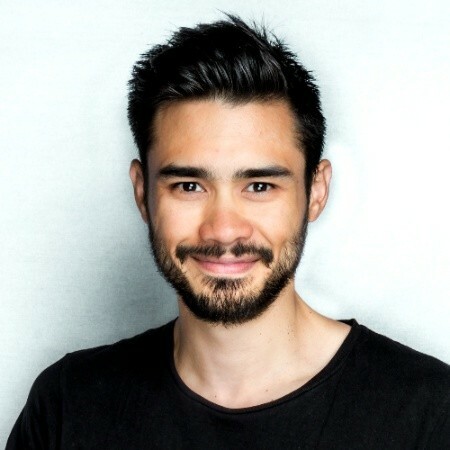 Having suffered from depression in previous years, he hopes his book “10 Ways Not to Commit Suicide” will help others struggling with mental illness. The tragic deaths of legendary musicians Chris Cornell and Chester Bennington in recent months is a stark reminder of the need to remove the stigma surrounding suicide. As to whether fans can expect new Run-DMC rhymes on the horizon, McDaniel was quick to quell any budding hope. 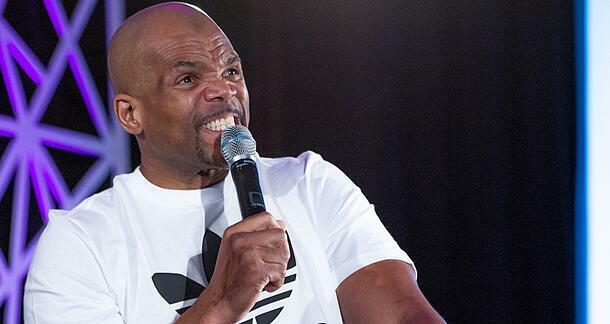 While confirming the release of a solo offering early next year, he borrowed words from other music icons to bury the prospect of a Run-DMC reunion. “I just saw an interview with Hall and Oates. They’re still doing shows like me and Run (Joseph Simmons), but they said they can’t make a record because the purpose of which they came together has been satisfied,” McDaniels offered. 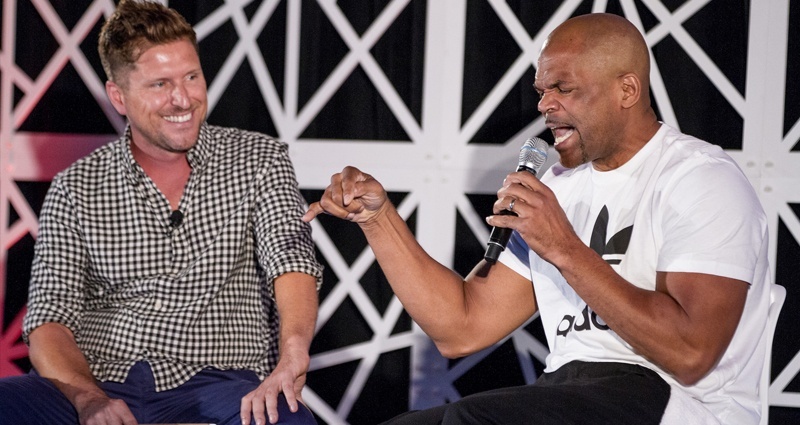 Run-DMC may no longer be around to evoke positivity and purpose through music, but McDaniels left RetailSpaces attendees with ample inspiration. 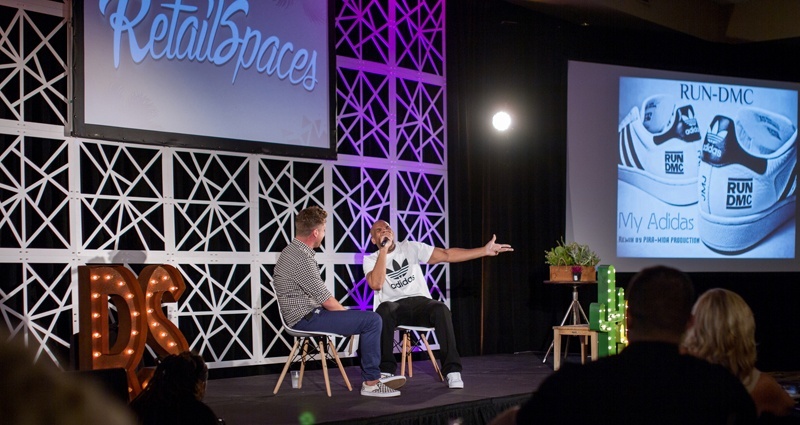 At first glance, advice from a hip-hop legend may not seem like a relevant resource for retail. But McDaniels’ words are worth some serious thought in tackling the challenges ahead. 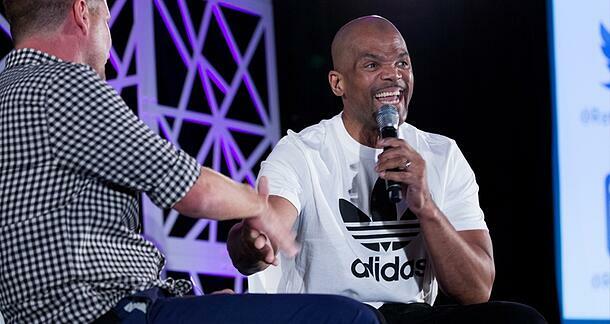 Watch the video below for the full conversation with Darryl ''DMC'' McDaniels. Enjoy!